Treo 755p for Sprint: First Images! The Treo 755p appears to merge the dark blue rubberized body design of the Windows Mobile Treo 750 with all the key layout, mini-SD slot, camera and slimmer, lighter, antenna-less design of the PalmOS Treo 680. Aside from this, the only significant disctinction between the Treo 680 and this Treo 755p is likely going to be price and much faster 3G wireless data capabilities – making the Treo 755p the first PalmOS smartphone to support 3G broadband connectivity... The similarities between both devices also likely means that existing Treo accessories for the 680 will work with the 755p. When released (some suggest a May 14 launch date) this new Sprint Treo 755p will replace the Treo 700p that Sprint launched back in May of last year. This clearly shows that Palm is delivering on its promise to shorten the lifecycle of its products – updating them regularly every 12 months – and also that the company is able to gain faster carrier certification to release its new smartphones. I'm confused by this posting -- I thought Treo 700p is EVDO and thus 3G already. Since we're talking 755p for SPRINT wouldn't this mean that all that is effectively new about 755p is miniSD and new form factor? What would be NEWS from my perspective would be a Palm-based Cingular HSPDA Treo. Question for Palm OS Treo lovers ... Although I like my current Palm 700p, I envy those that have a slimmer design product. (other companies and OSs) How is it possible that others can engineer thinner phones, yet even the 755p photos above still has a chunky look? I've always thought that my chubby 700p had a few extras that those other guys didn't, but I'm starting to believe the only advantage is a bigger battery ... something I'd have to deal with 'if' I switch to a 'still chunky' 755p. In reality the only advantage would be slightly smaller and lighter but less battery life ... am I missing something? I agree re a GSM HSDPA Palm OS Treo, Treonut. I'd be all over that. I'd even take UMTS (preferably with an upgrade to HSDPA). No way I'd switch to Sprint or Verizon. The other thing is that when the 750 launched, the reason cited for miniSD over SD was to make room inside for the HSDPA antenna. Has that been clarified as the reason for it on the 755 (the first internal EVDO antenna)? And has the 755 been confirmed to have miniSD as opposed to SD? After all, the 680 shares the form factor and has SD. That's one thing I'd hate to give up--my 8GB SDHC card. Other than in the form of VOIP, EVDO Rev A cannot do simultaneous data and voice. A misinformed rumor seems to be repeated all over the Internet that it can do simultaneous voice and data in it's native format when that is not the case. "Qualcomm Rev A modems have the ability to maintain both circuit switched voice and packet data calls from the same radio, this functionality is not available in Qualcomm Rev. 0 chipsets." "The ability to offer VoIP services over Rev. A networks will profoundly enhance operators' services and application offerings. VoIP service offerings will enable a variety of bundled or converged services and applications such as simultaneous voice and data services." Again, simultaneous IP based voice and data is different than simultaneous circuit switched voice and packet data. @RichC, if you look at the slimmer phones such as the Moto Q, Blackjack, Nokia E62 you'll notice they don't have touch sensitive screens. It's this and the battery size that allows them to be that thin. "@RichC, if you look at the slimmer phones such as the Moto Q, Blackjack, Nokia E62 you'll notice they don't have touch sensitive screens. It's this and the battery size that allows them to be that thin." I love Treo's, but we make too many excuses for them being big and clunky. The iphone, which is about half as thick as the new "thinner" treos has a touch screen, and an 8gig flash drive built in, and it has about the same battery life. If the new rumored Treo isn't slick, thin, and innovative, my next smartphone will be the iphone. I love my Treo, but they havn't come up with a significantly new thing in 4 years. That is inexcusable. Gaber, while I can't speak for anyone else, I never expected the 755 to support HSDPA--for the very reason you cited. My point above (and I think Treonut's as well--at least, as I read the comment) was that the 755 isn't that big a change from a 700, unless there's more to it we haven't seen yet. Internal antenna, smaller size, soft-touch coating, maybe miniSD instead of SD... an upgrade more or less comparable to a 650-to-680 upgrade (which I did last fall). While I'm glad to see the 755 in some ways, 1) I want to see what Jeff Hawkins's 3rd device is (to see if for my usage it makes sense to replace either my 680 or my T|X with it) before I make any further upgrades. Again, let me emphasize *if it makes sense for my usage*--the rumors I've heard say it's a decidedly different animal from either a standalone handheld or a Treo. On the other hand, since there's some definite overlap between standalone Palms and Treos, maybe there will be with this new one too. Btw, my hunch is that the new device is what has the codename Sherlock, not the 755. The codename makes more sense that way--to me, anyway. No solid basis for that yet. Will it offer voicedialing over a bluetooth headset? 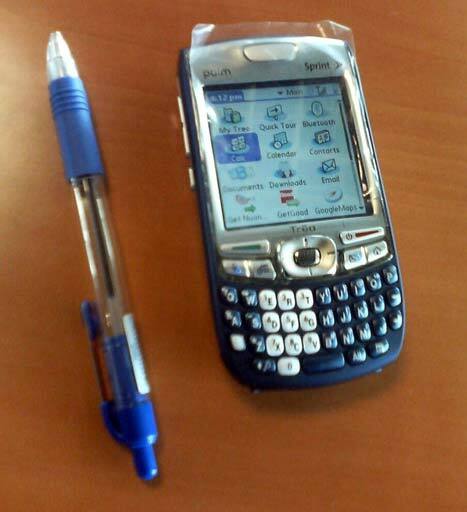 Correction: my mistake, I did not mean to point out that the Treo 755p would have miniSD. It has a standard SD slot as the Treo 680. "making the Treo 755p the first PalmOS smartphone to support 3G broadband connectivity... "
As mentioned above, this is incorrect. The 700p was the first, which is what the 755p is replacing. A couple of things I miss not having are video conferencing (looks like it doesn't have that). USB Host/usb otg (I don't see anything about that). A better quality camera (maybe but not that much better). I long for the days when having a Palm Treo meant that you were the first to have some feature, but all the ones mentioned above are already avaliable on other platforms. Oh poo. Any idea how much ram we are looking at?? I was one of the first to have the Treo 650. I still have it. I love it, and use it several times a day. I am, however, ready for a new and better phone/pda. The iPhone looks awesome, but it lacks 3G internet speeds, which is a major selling factor for me. I would also like a cool user interface. Give it to me in Treo form, and I will buy. Andrew, why are you touting this as the first 3G Palm Treo -- the 700p already does EV-DO on Sprint and Verizon? As people said above, from the specs we see now, the 700p->755p sounds very much like the 650-680 upgrade. It brings the new form factor which is nice, but not a lot of sizzle on the tech side. Since I'm a GSM user, I'm still waiting for a 3G GSM Palm Treo (HSDPA or whatever); that would be big news. Right now for GSM we can choose between the 680 (not 3G) or the 750 (Windows). How about the camera...? Is it going to be the lousy one included on the 680 or the better one from the 700w? Will the 755p deliver "Push" e-mail? Does anyone know what size memory card the 755p can take? I am looking to have all my accessories when I get the phone on the 14th. Sprint's new release web site shows for the first time today the specs on the treo 755P.